Solar researchers all over the globe are looking for developing a solar cell with the potential to break the 50 percent conversion efficiency barrier. And it seems this will be a reality soon, as the U.S. Naval Research Laboratory scientists in the Electronics Technology and Science Division, with collaboration from the Imperial College London and MicroLink Devices, Inc have proposed a new triple-junction solar cell design which has the potential to break the 50 percent conversion efficiency barrier. NRL research physicist Robert Walters says "This research has produced a novel, realistically achievable, lattice-matched, multi-junction solar cell design with the potential to break the 50 percent power conversion efficiency mark under concentrated illumination,". At Present, the world record triple-junction solar cell efficiency is holded by SJ3 Solar Cells (link), which has a conversion efficiency of 44%, under concentrated sunlight. In multi-junction solar cells, each junction is tuned to different wavelength bands in the solar spectrum to increase efficiency. High band gap semiconductor material is used to absorb the short wavelength radiation with longer wavelength parts transmitted to subsequent semiconductors. In theory, an infinite-junction cell could obtain a maximum power conversion percentage of nearly 87 percent. The challenge is to develop a semiconductor material system that can attain a wide range of band gaps and be grown with high crystalline quality. 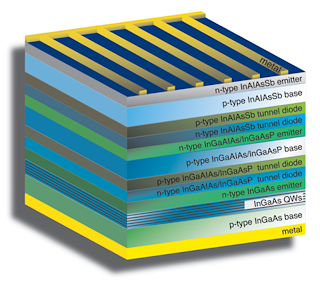 By Taking above into consideration and applying band structure engineering, via strain-balanced quantum wells, the NRL research team has produced a design for a MJ solar cell that can achieve direct band gaps from 0.7 to 1.8 electron volts (eV) with materials that are all lattice-matched to an indium phosphide (InP) substrate. The primary innovation that enabled the Scientists to come up with this new path to high efficiency is the identification of InAlAsSb quaternary alloys as a high band gap material layer that can be grown lattice-matched to InP. Drawing from their experience with Sb-based compounds for detector and laser applications, NRL scientists modeled the band structure of InAlAsSb and showed that this material could potentially achieve a direct band-gap as high as 1.8eV. With this result, and using a model that includes both radiative and non-radiative recombination, the NRL scientists created a solar cell design that is a potential route to over 50 percent power conversion efficiency under concentrated solar illumination.